Hey Y’all! It’s April from Grade School Giggles and I’m excited to be writing today’s post. 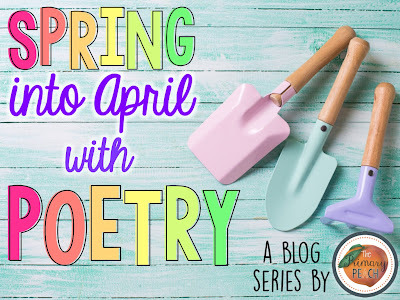 Since April is National Poetry Month, I wanted to share some fun and easy ideas for writing poetry with kids. One of the best things about poetry just how many ways it can be done. Really, there is a style of poetry for everyone. Its flexibility makes it accessible to kids who are still learning to write. 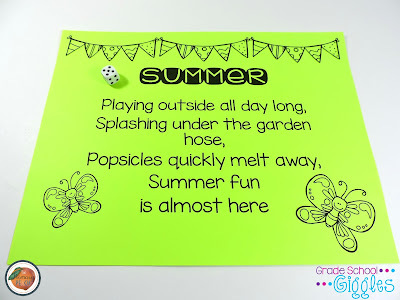 Because poetry doesn’t have to follow all of the grammar and punctuation rules it is a great opportunity for kids to play with their writing. So, let’s have some fun and look at three playful ideas for writing poems with kids. Dice Poetry - Most of these poems involve free style poetry. This one is a little more structured because it sets limits on the number of lines and the number of words in each line, but it’s definitely still fun. You might want to try it out along with one of the other ideas and ask your kids which one they prefer. 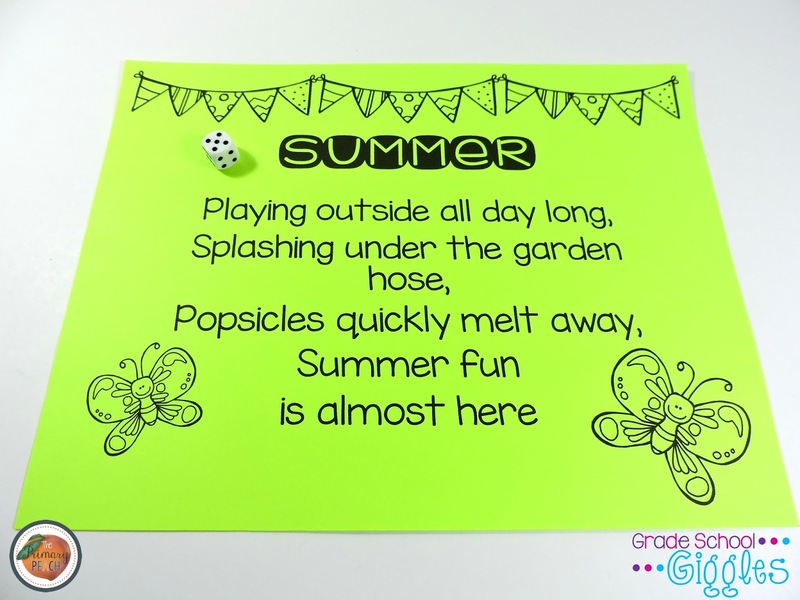 Creating a dice poem is simple. Once you’ve picked a topic, roll the dice to determine how many lines to write. Then, roll the dice once for each line to decide the number of words to include in each line. 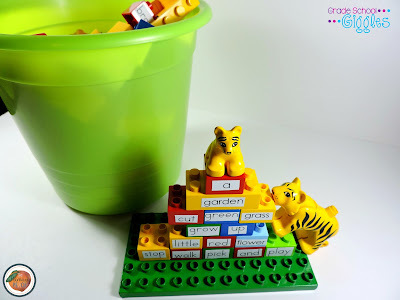 You’ve probably seen teachers add sight words to blocks for a word work center. My daughter has outgrown her larger blocks and is now playing with the small ones. So since I had a whole box of them laying around, I thought it would be a fun way to create some poetry. I printed out a bunch of words onto label paper and added them to the blocks. Being a very visual person, I kind of have a thing for shape poetry. It just seems so playful. An easy way to create shape poetry is to print out some black line clip art. You’ll want it to fill up the page. Put a blank piece of paper on top and staple the two sheets together at the corners avoiding the clip art. The picture on the bottom sheet will show through and acts as a guide for where to write. 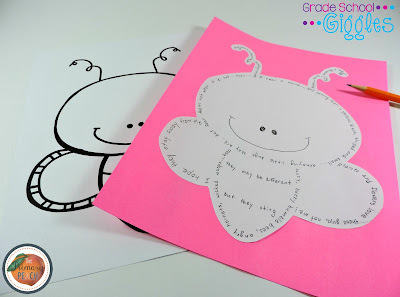 Once the poem is done cut it out and glue it onto a sheet of colored paper to make it pop. 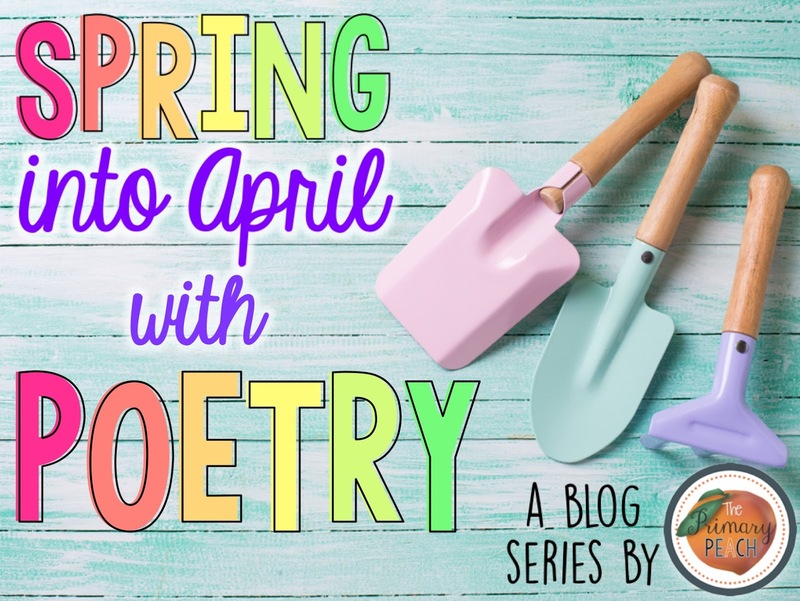 Enjoy the rest of April and I hope you'll take some time to enjoy creating poetry with your little ones. For more exciting writing activities check out my Pinterest board. Follow Grade School Giggles's board Writing on Pinterest. I am impressed by the new logo of this university. It seems so natural also a proud moment for the students. The university reflective essay is all about writing new techniques. G club The online casino site is another fun channel that will allow you to access and play online gambling, along with tracking interesting stories and interesting stories, and today we have a story. I know about eating for the sake of health, that is, eating apples. Because that Apple. It is a cold fruit that is rich in nutrition and you know that Apple. It can help to detoxify the body well for detoxification, it is a toxin removal from the body another channel. The apple is also help to detoxify the body as well, because the apple is rich in pectin. There is a dietary fiber that can trap cholesterol and heavy metals in our bodies, so it helps to get rid of toxins and excrete it from the intestine.